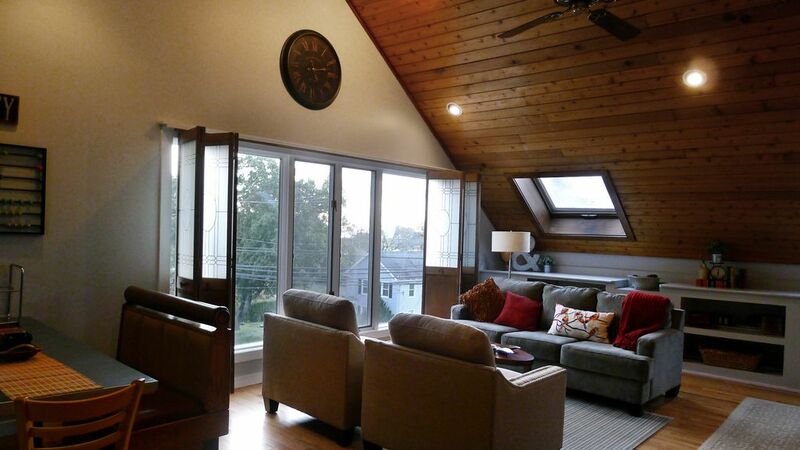 You'll be telling all your friends how you found the perfect spot to enjoy a visit to Branford's Stony Creek Village when you book at the Tree Fort Suite. The high pitched ceilings and rustic wood accents make for a cozy nest - yet with all the modern amenities for clean, comfort. Open plan is airy and bright - with six skylights to add to the sunny disposition. Slight water view reminds that you are at the shore. One large master bedroom with Queen bed and a smaller bedroom has (2) twin beds - perfect for small families to come visit - there's even a bed all ready for your dog! The property is built onto a hill - so just one flight of steps up to a spacious deck to reach your nest! Huge deck makes a nice play area - with access to a small yard. Short walk to the village, marina, and nature trail. As Branford natives, we both are very familiar with the local area and enjoy renovation and preservation projects, and are happy to share our tales of what we learned about our building's history and character. Both fans of Big East Basketball, Claudio is a Providence College Friar and Barbara is a Villanova Wildcat - so when it's March Madness, we are glued to the stats! After globetrotting in the yachting industry, Barbara's 15-year residence in Florida came to a halt when she relocated back to New England in 2008. As frequent vacation home renters ourselves, we know what travelers expect when they arrive at their destination: clean comfort. We renovated Claudio's childhood home in this great New England town and know that the shoreline real estate here is HOT! Together we merged our skill-sets on the Stony Creek Depot project to showcase our design aesthetic, expand our retail vintage business and secure a home in a highly coveted neighborhood. Our guests can book short-term stays in the spacious residential space to enjoy this wonderful little coastal village. Residents and tourists take in the beautiful Thimble Island views and nature hikes that are just footsteps from the Depot's front door. We love Branford and consider ourselves lucky to get a footing in the Stony Creek village, where properties often remain in the same family for generations. We are dedicated to helping this property flourish as a vibrant part of the community since it has a 100+ year history of adapting to commercial and residential enjoyment. This property retains the original flavor of an older, coastal New England home, while bringing in some of the modern comforts that we enjoy and guests will expect in a vacation rental. Without having direct water views we are able to keep the price point a bit lower than higher dollar properties footsteps away, making it a budget-friendly alternative to a generic hotel room. Because we are also pet-friendly and only require a 2-day minimum booking (not a full week), Stony Creek Depot is a great weekend getaway retreat. We love using this residential space while we run our onsite, street-front business and we hope that making it available for short-term rental will enable visitors to appreciate the charms of the Stony Creek village. Near Long Island Sound. Take a boat tour of the Thimble Islands if you visit during late spring to fall. Stony Creek just earned a village designation full of typical New England coastal charm. Only 2 places to eat breakfast and lunch. Great views of the Thimble Islands. You can see a glint of water from our property (more in the winter when the leaves have dropped) - just take a short walk to enjoy a nature trail that is on the old Trolley tracks. Clean sheets and towels are ready for guest use upon arrival. Beach towels avaialble for summer guests. Open plan. Game table. Large flat screen TV on wall mounted swivel. Kenmore with ice maker and water dispenser. We do not provide groceries and spices. Unopened or surplus pantry items will be left for future guests. Premuim HD channels with movies, sports and Netflix. Some classics. Please leave for others to enjoy. Of course we have Monopoly, Scrabble, cards, poker chips --- the inventory will grow! SECURITY: To promote safe conditions and support our property ownership rights and responsibilities, exterior entryway areas of the property are monitored by motion-activated lighting and cameras. Rest assured, we respect guest privacy during any stay on premises and will readily share information about the camera capabilities with booked guests. It was delightful and it’s a gorgeous spot! Barbara decorated the beautiful house just perfect! We had such a great experience and love the Stony Creek Treehouse spot!!! Highly recommend it!!! We walked to the park, the library, the beach and the market. Barbara was the best host!! She left us a beautiful welcome basket filled with almonds, cookies, snacks galore and fresh scones. It was such a special touch. We walked in and fell in love with the space. It was so festive and they put the TV in our kids room for us too. They went above and beyond to make it so welcoming and full of Christmas spirit. I can’t thank them enough. They even put up 2 gorgeous Christmas trees, lights, wreathes and angels. I’m a huge fan of angels so I actually moved one from the Bedroom to the Kitchen, so we we can enjoy looking at it. I would highly recommend staying here. They also have games, puzzles and paper/crafts for kids. The kitchen is gorgeous, fully stocked and we loved the comfy booth. We entertained and rang in the new year in style. We all unfortunately got pretty sick, bad stomach flu so weren’t feeling well when we departed at 3am to catch early flight. My 4 yr old was up throwing up all night right before all had to leave with 7 suitcases, 8 bags and 2 unhappy kids. My parents gave the kids such aweosme presents and so many. It was a miracle we were able to pack up stuff, sick kids and clean as best as we could while still making out 6:30AM flight. We felt terrible not being able to clean up some last minute things or clear out a few left overs from the fridge. Happy New Year everyone!!! Barbara is the perfect host! Everything was perfect as usual since we are returning guests. Thank you Barbara! Totally enjoyed my stay at Barbara and Claudio's rental in Stony Creek. The unit is spacious, very comfortable and beautifully decorated and it was well stocked with anything you might need. It's located close to a small beach, a marina, a park and a wonderful breakfast/lunch cafe. It's also close to Rte 1 and I-95 which will get you anywhere you want to go. Barbara is a gracious hostess and quick to respond to any questions you might have. Cozy, immaculate home with delicious treats and fun beverages to watch the sunset. Would definitely stay in this lovely 2 bedroom apartment steps from the water. Our golden retriever Sadie was happy on her dog bed and huge deck. Barbara was a call away when settling in for our Netflix fix. Can’t wait to visit again. Barbara is a friendly, delightful host. She is very attentive to the details and making your stay like home. Great location as well. We had a wonderful stay at your cottage! Thank you so very much for being so accommodating. We look forward to returning to beautiful Stoney Creek in the future! Lots of restaurant choices in Branford with all types of cuisine. New Haven and Yale University are 10-15 minutes drive south on I-95. Hammonasset State Park beach in Madison - 15 minutes north on I-95. Outlet shopping centers are 15 minutes drive to Clinton, CT. Mystic Seaport - 30 minutes drive north on I-95. Mohegan Sun casino is only about 40 minutes drive with its shops and restaurants.